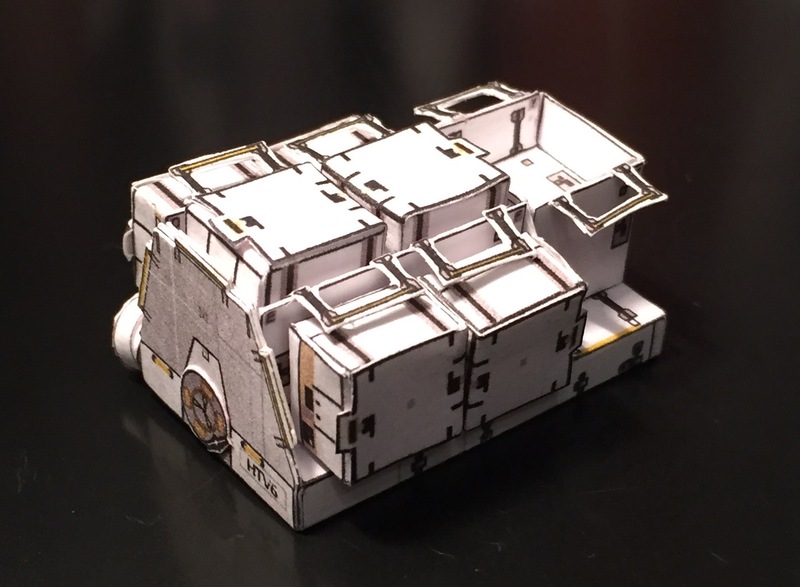 On Dec 9, 2016 a Japanese H2-B rocket launched the unpiloted HTV-6 cargo carrier “Kounotori 6” to the International Space Station, with a fresh set of high-power batteries, critical parts for the research lab’s carbon dioxide scrubber, and several tons of food water and provisions. 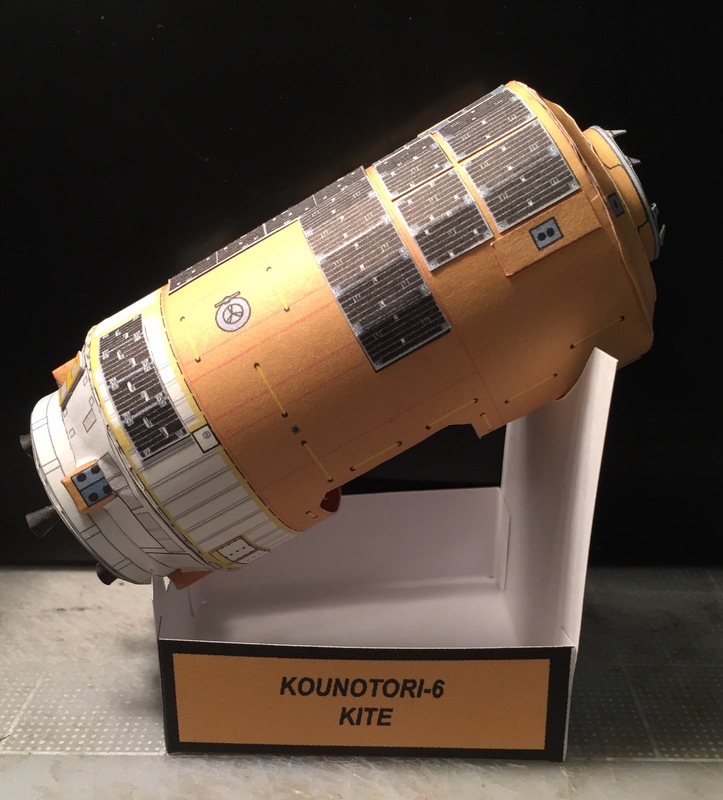 Kounotori 6 is planned to arrive to the ISS on Tuesday, culminating in the grapple of the HTV by the Space Station’s Canadian robotic arm around 1100 GMT (6 am EST). 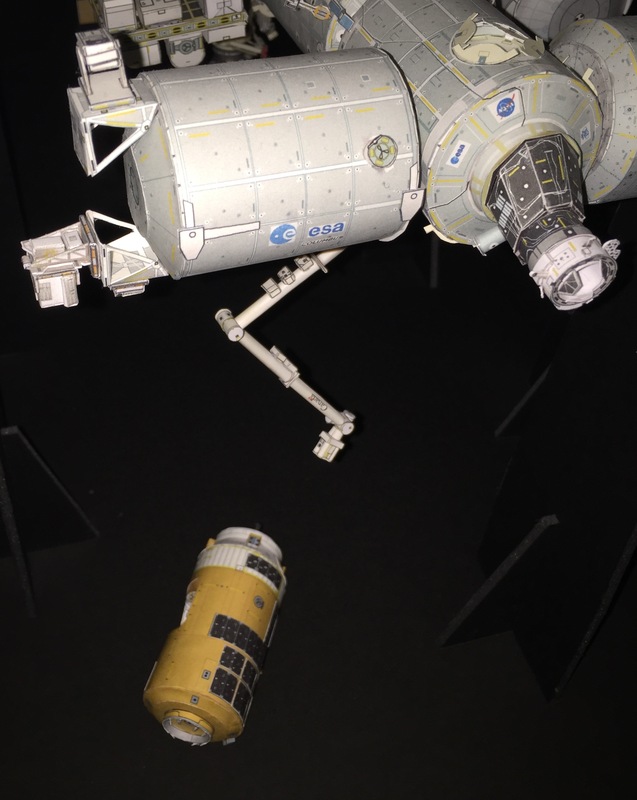 The HTV-6 paper model is in 1:100 scale to match the ISS papermodel. 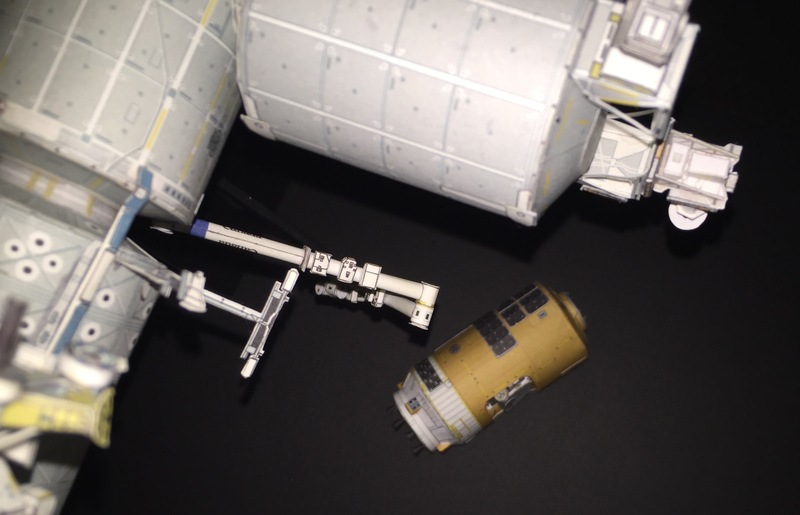 All the details were obtained from photos of the real vehicle and from JAXA’s HTV-6 press kit. 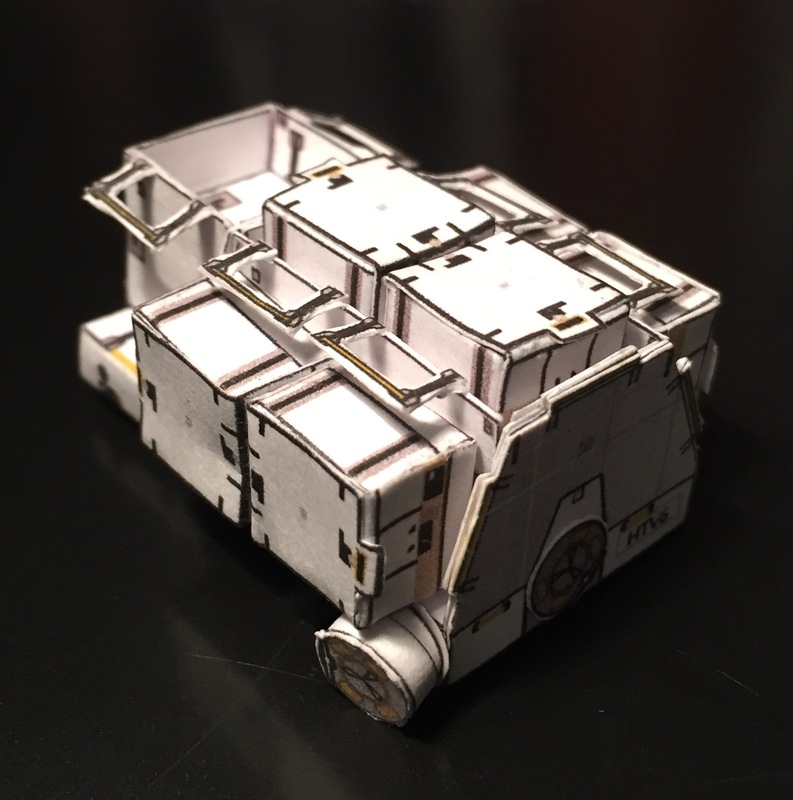 I have done an extensive research of the vehicle and its mission, including the exposed pallet payloads and the experiments. 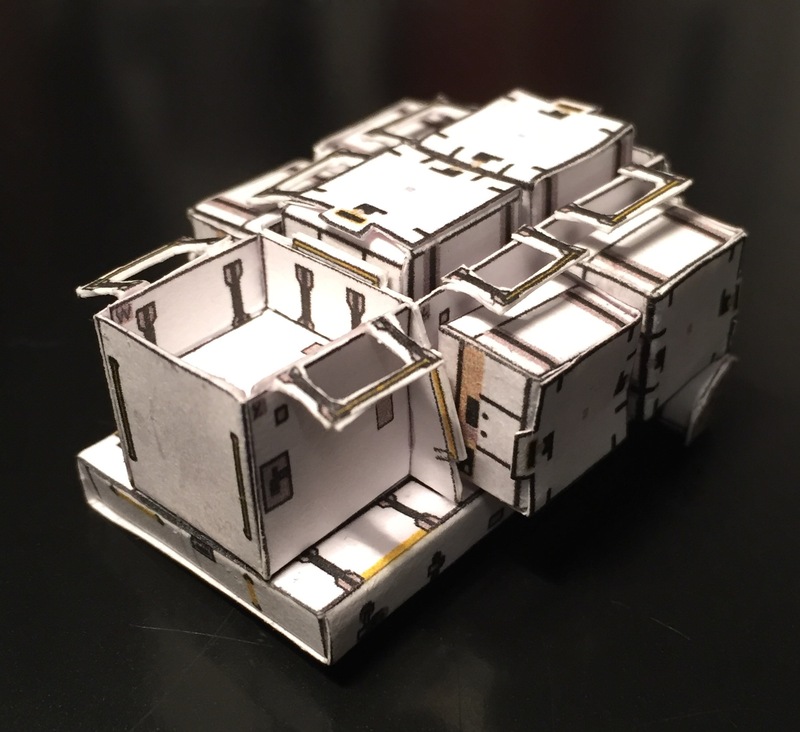 The model for this presentation is my prototype. 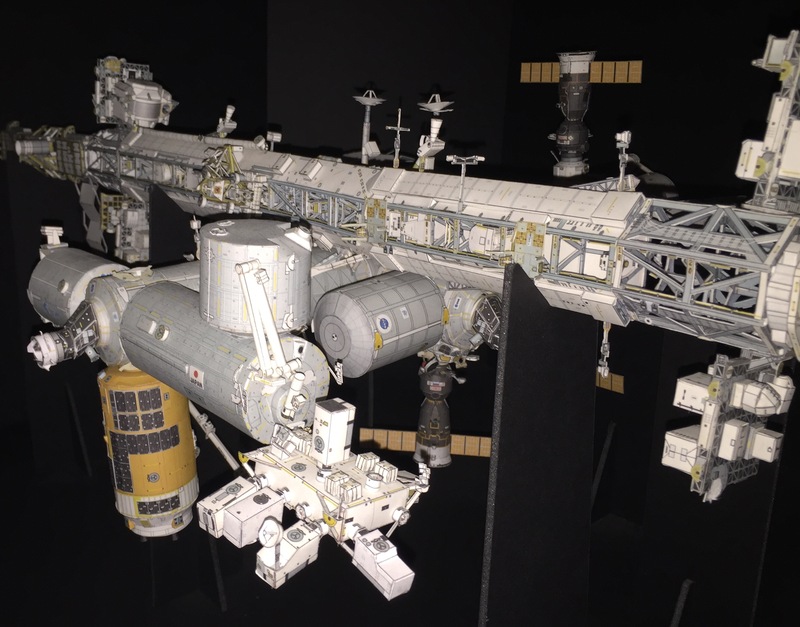 Because of the scale used, the exposed pallet for this mission is very complex, therefore it is very difficult to model the small parts, for example the hand rails. 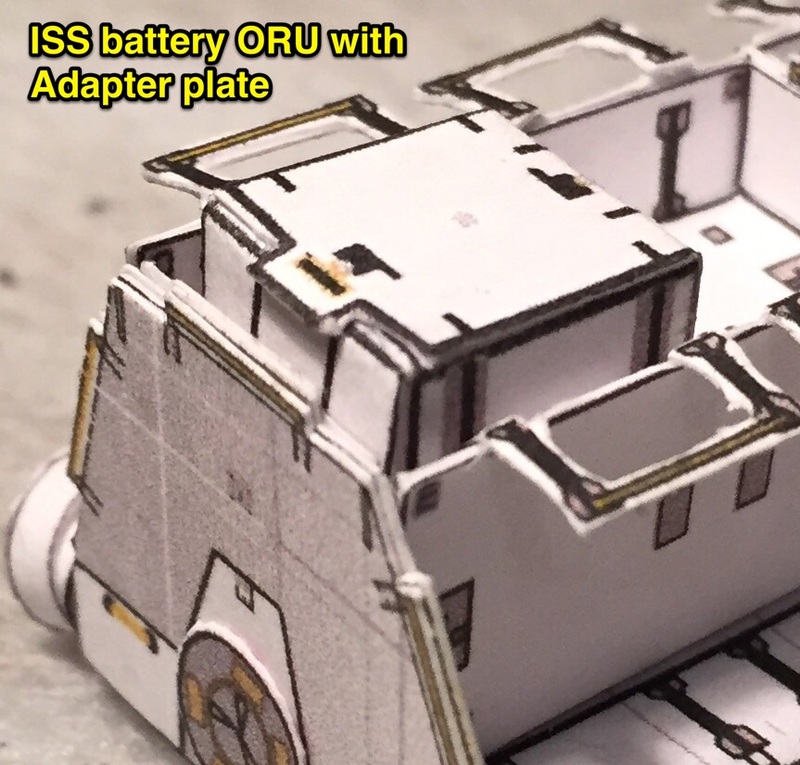 For better results, use thin but sturdy card stock. 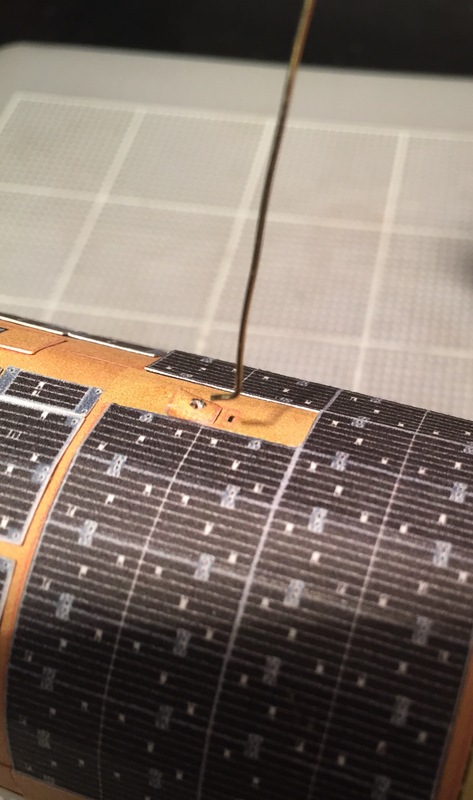 Also, the use of excessive water based glue is a factor why some parts are warped. 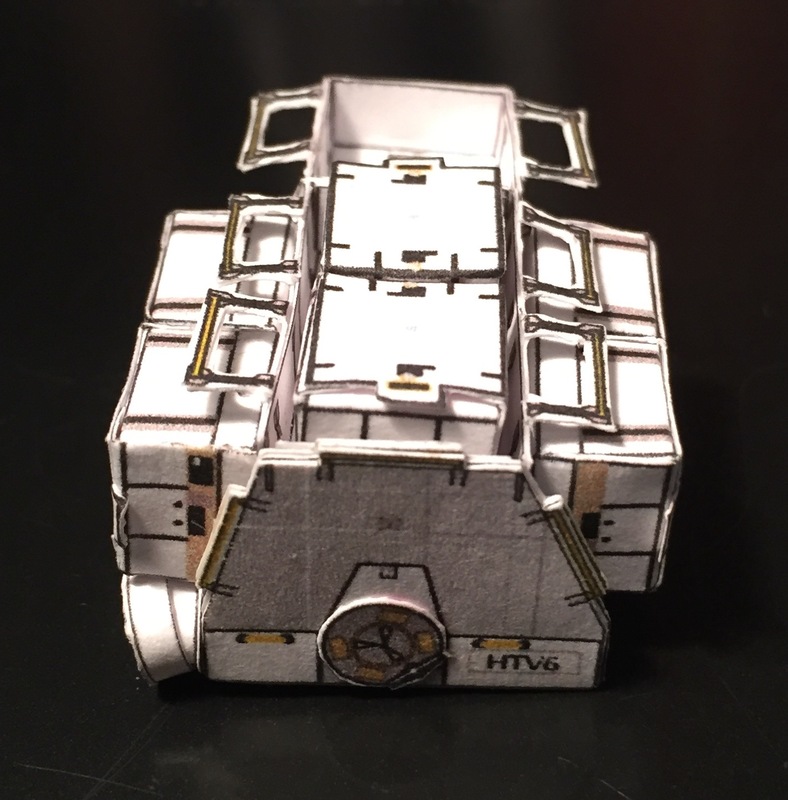 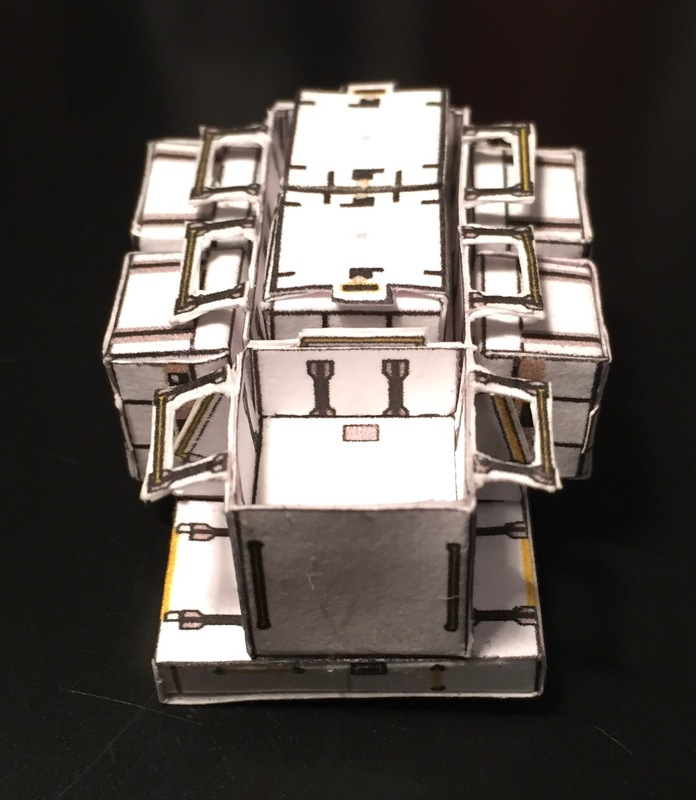 In the hands of experienced modelers, this HTV-6 pallet can be build with better results. 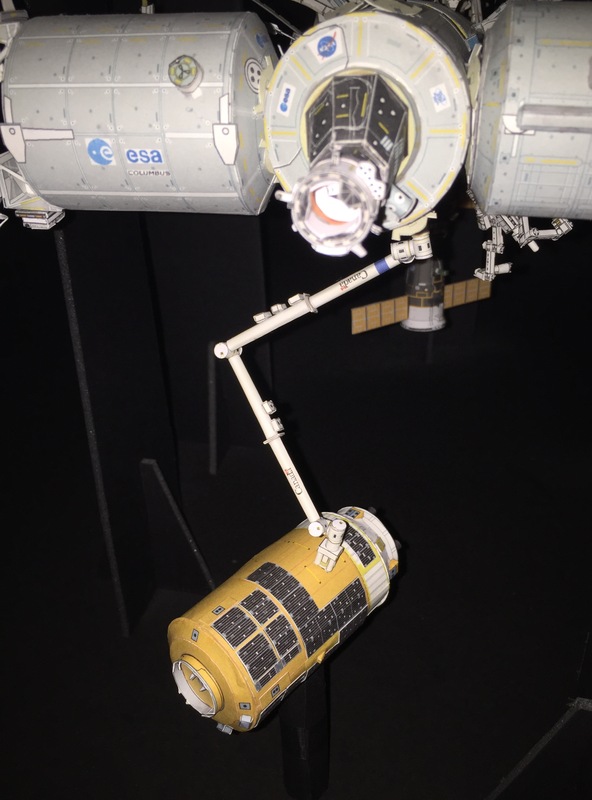 For this 6th mission, the HTV carries an enforced Exposed Pallet that holds 6 lithium-ion batteries destined to replace a portion of the space station’s aging nickel-hydrogen batteries. 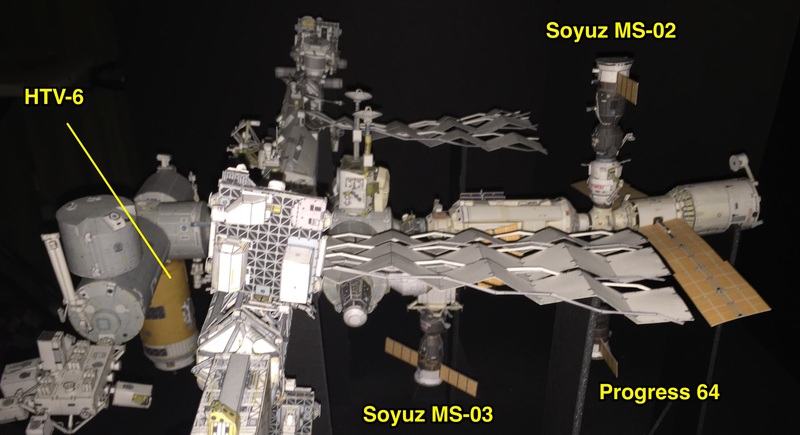 The new batteries are lighter and more efficient, one lithium-ion unit is capable of replacing two of the old models, and will be installed outside the space station starboard S4 power truss, one of the laboratory’s four main solar array modules. 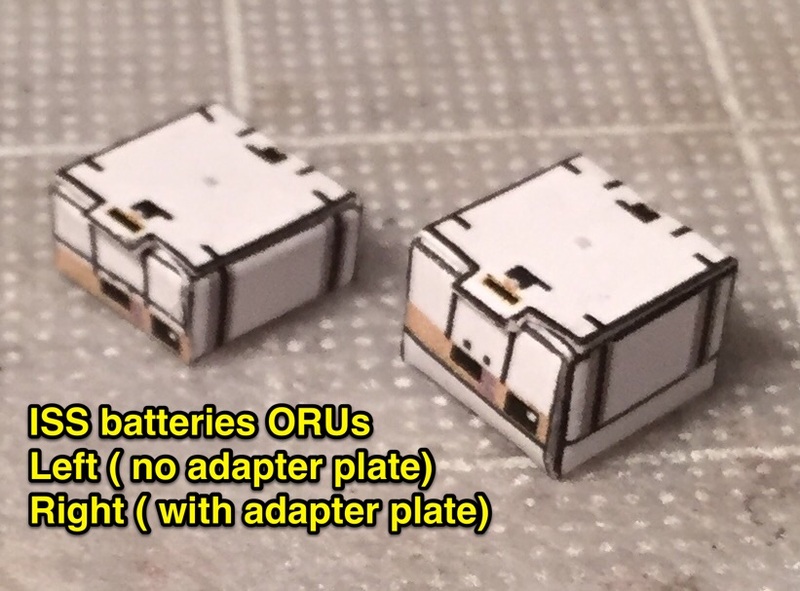 The following photos show the pallet in different angles with all 6 new batteries with their respective adapter plates. 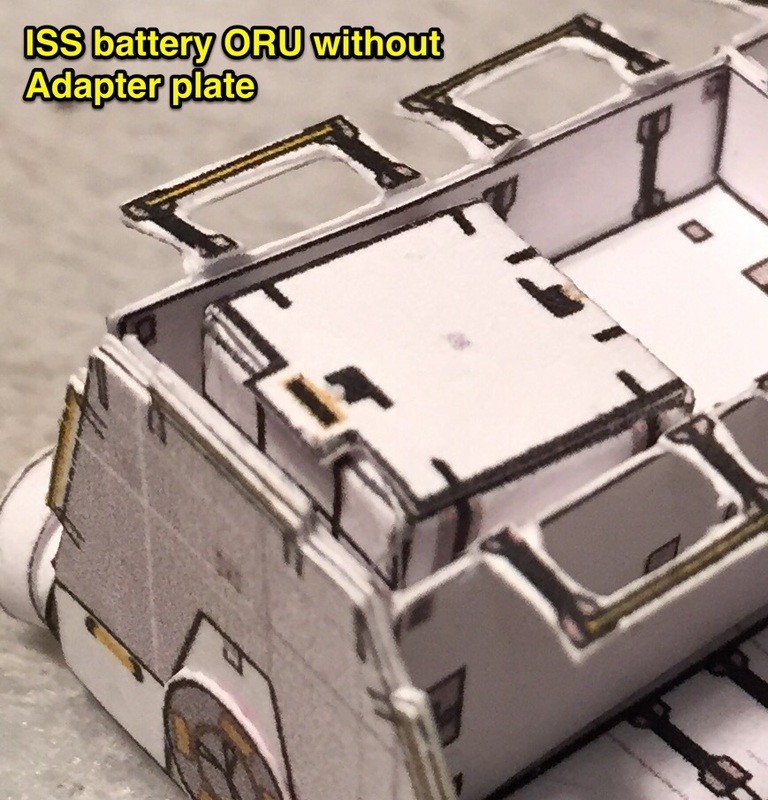 Difference between batteries without and with the adapter plate. 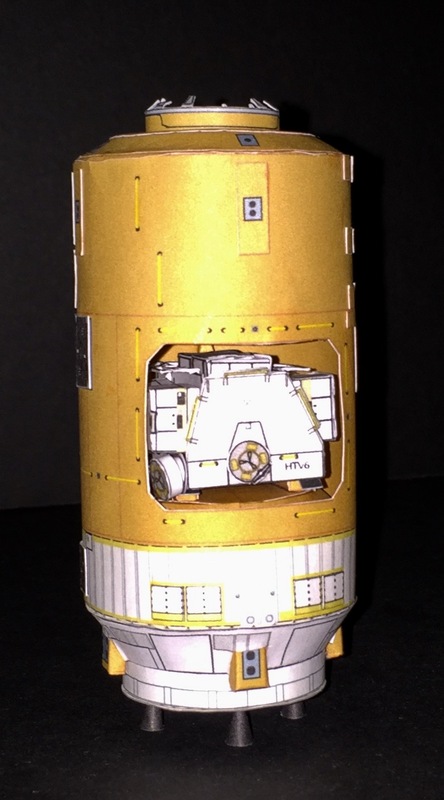 Upon its return, the HTV-6 will dispose 9 old batteries without adapter plates. 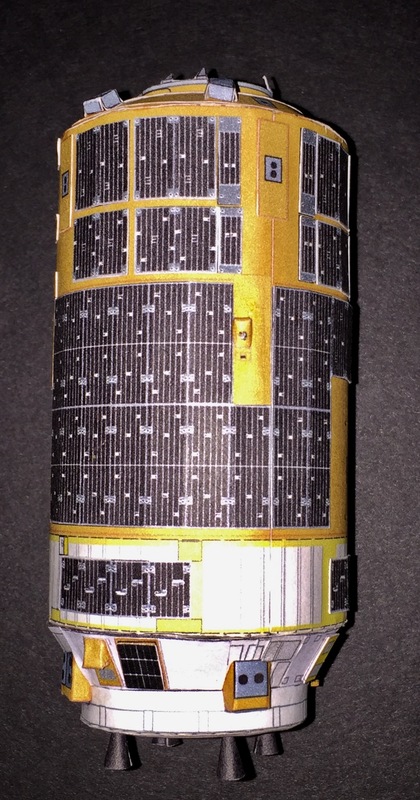 For this presentation, the pallet model holds all 6 batteries with the aid of scotch tape. 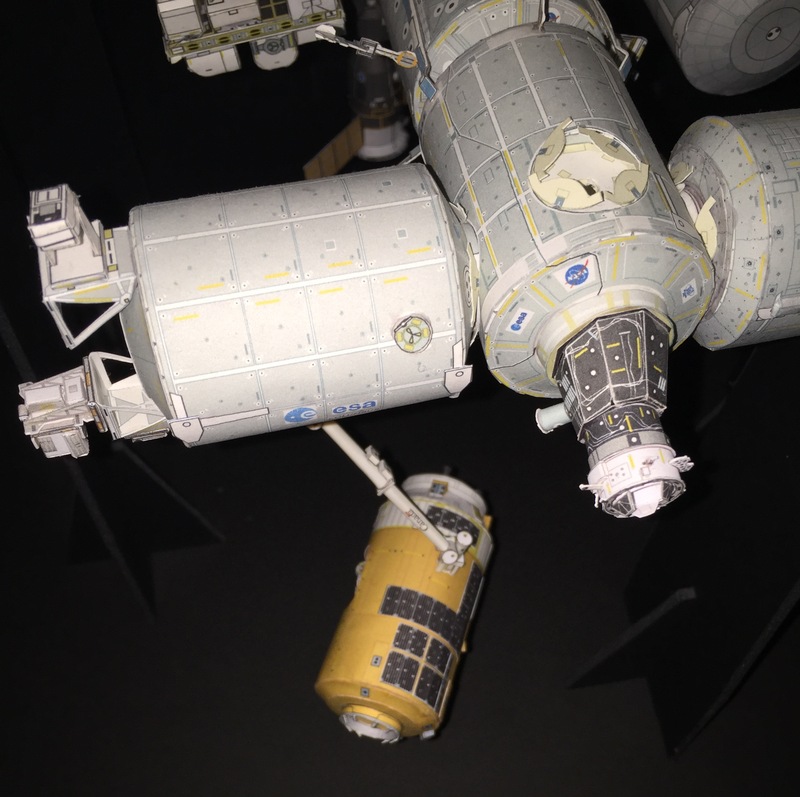 This was done because at the end of the mission I will show the pallet with the old 9 batteries in disposal configuration. 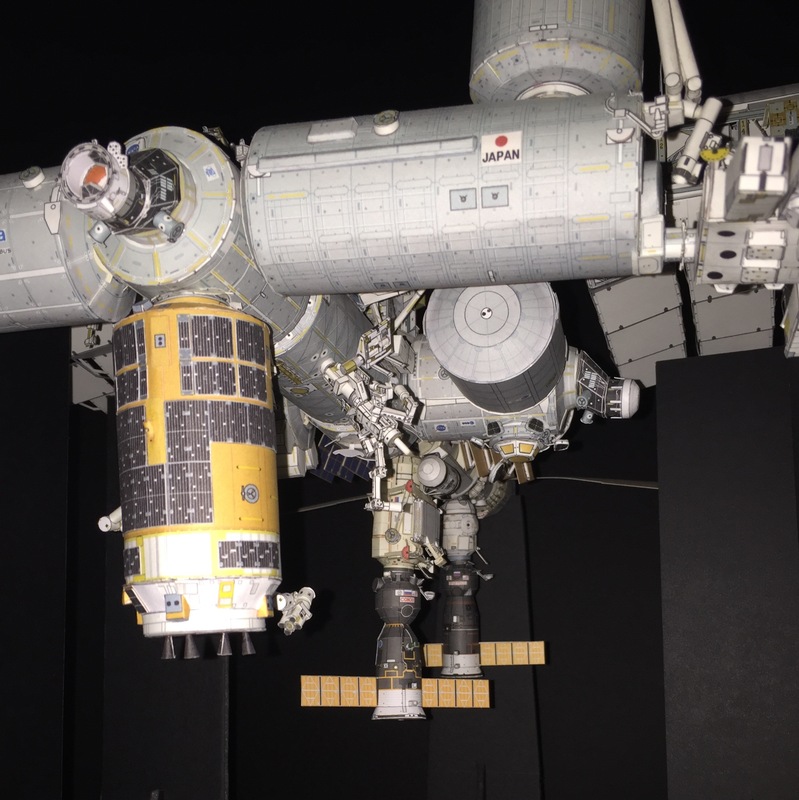 During the mission, I will post photos of the pallet with Dextre removing the batteries and installing them on their new location. 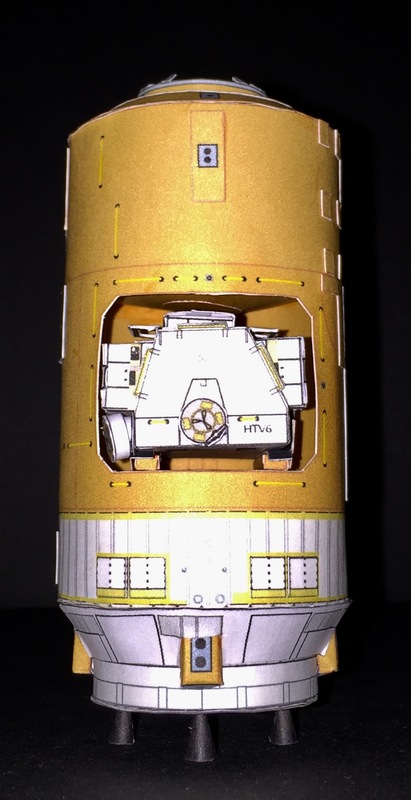 The HTV-6 also carries experiments on the outside of the cargo carrier. 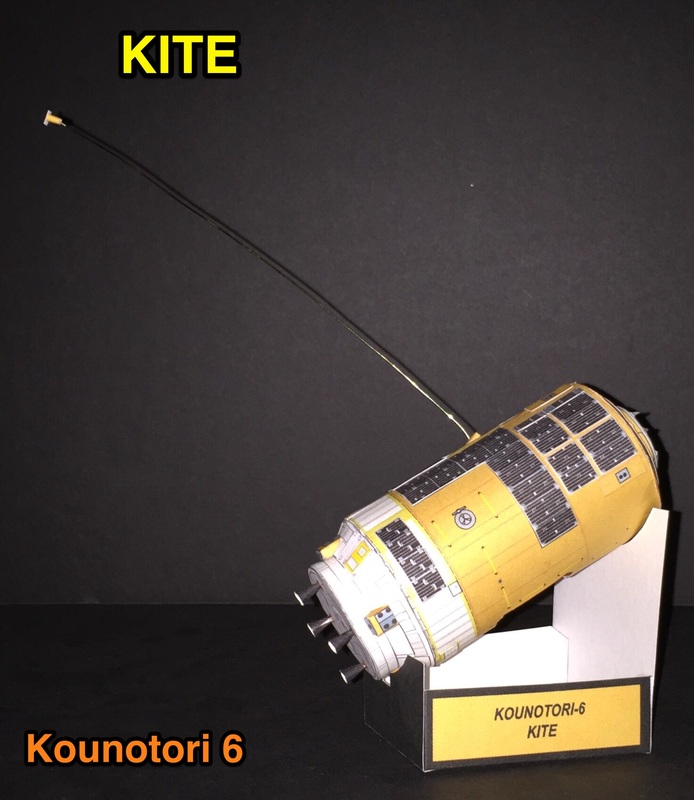 The KITE experiment is an experimental electrodynamic tether. 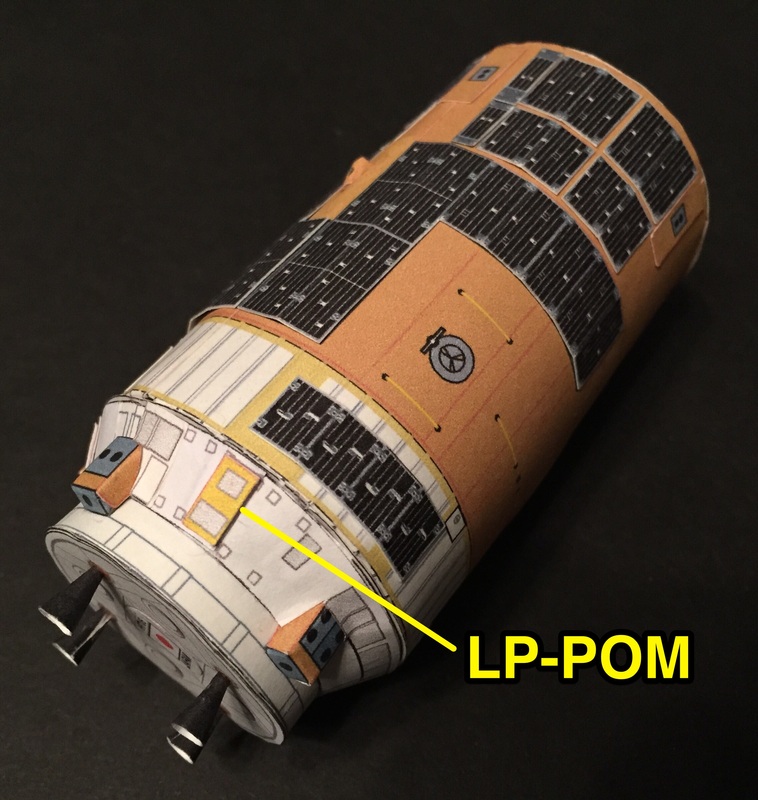 It will be 700 m long when deployed. 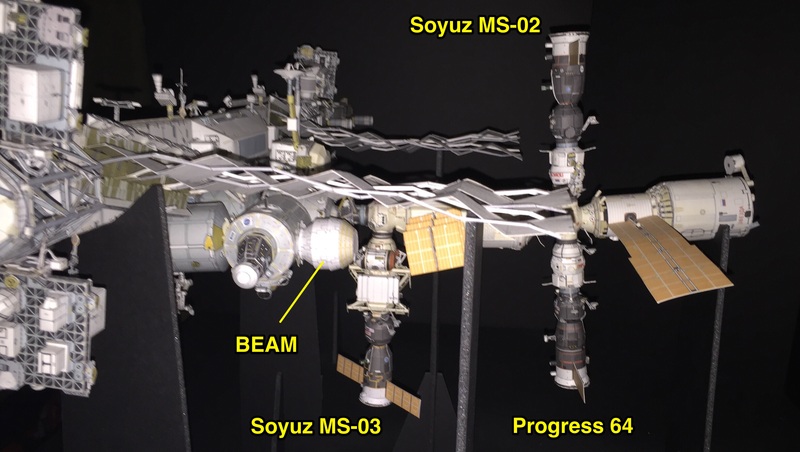 This experiment will be conducted following Kounotori 6 departure from the ISS and is to be held for a week. 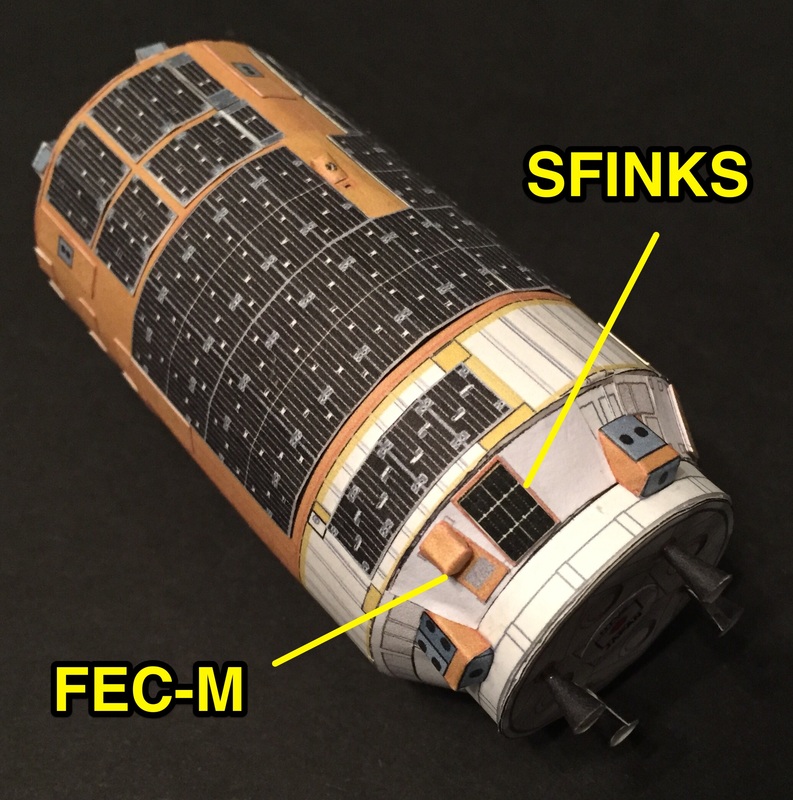 The main objective is the orbital demonstration of both extending an uncoated bare-tether, and driving electric currents through the electrodynamic tether. 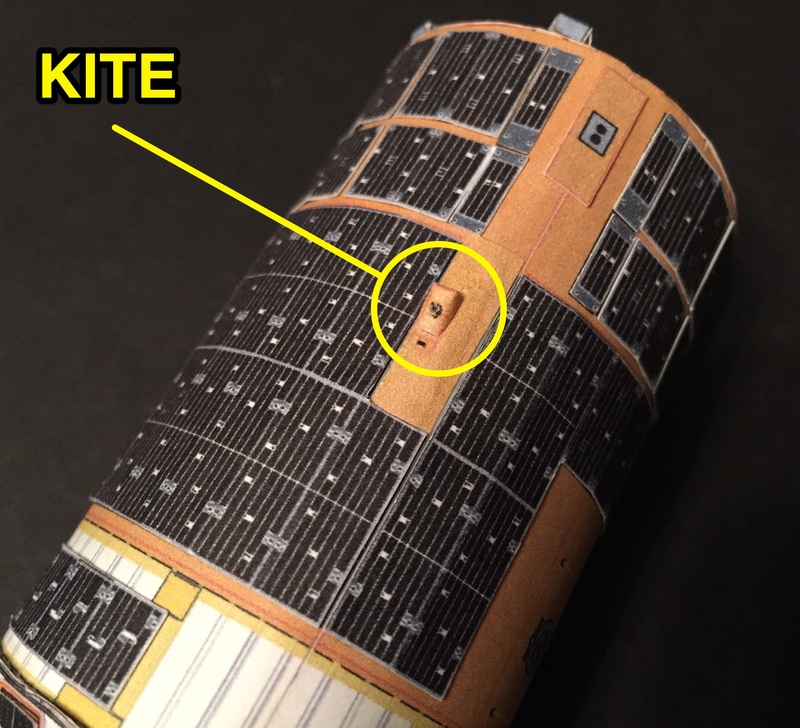 Notice that on the real HTV-6, a solar array had to be removed in order to place the KITE experiment. 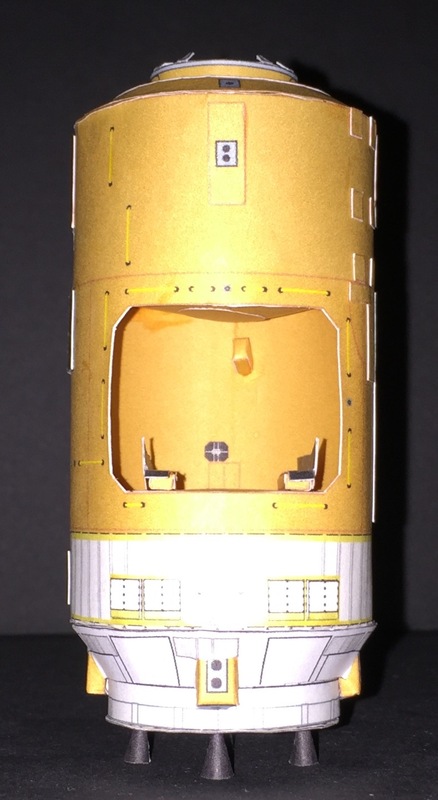 This photo shows the inside of the unpressurized cargo area showing the small rectangular box protruding into the cargo area. 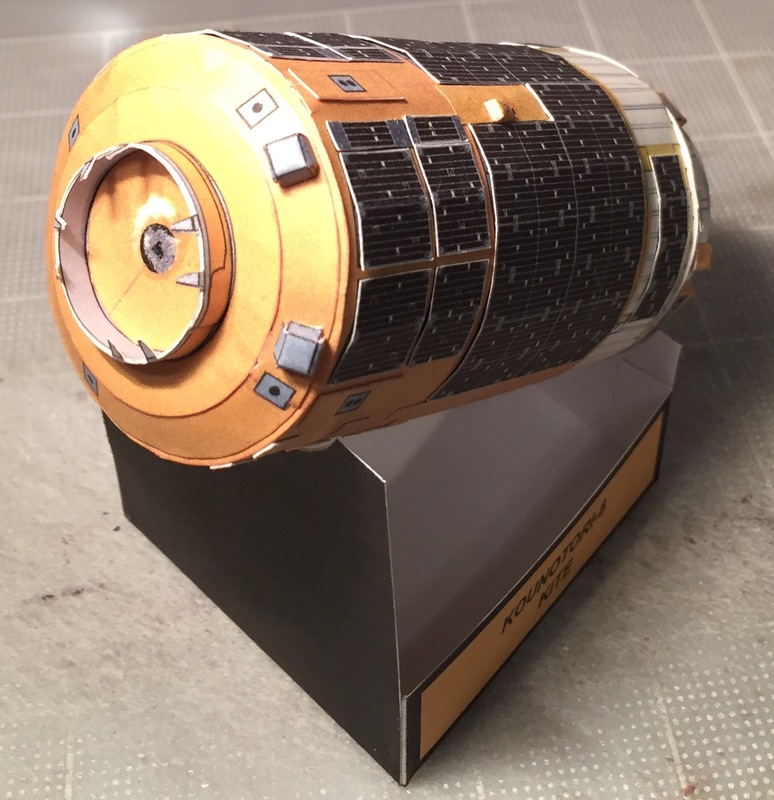 This is the KITE experiment casing. 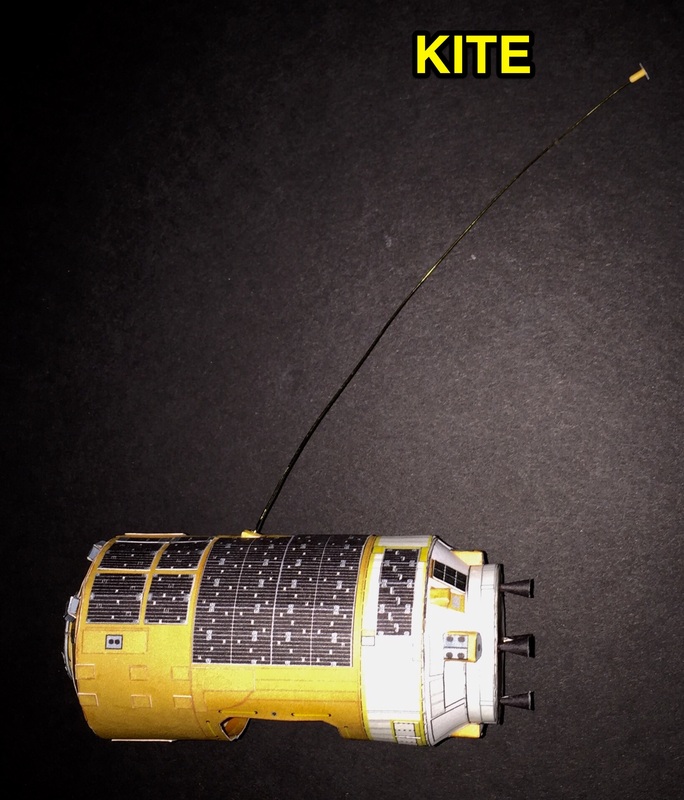 I have included in the download file the KITE experiment with a stand to display the HTV-6 with the tether. 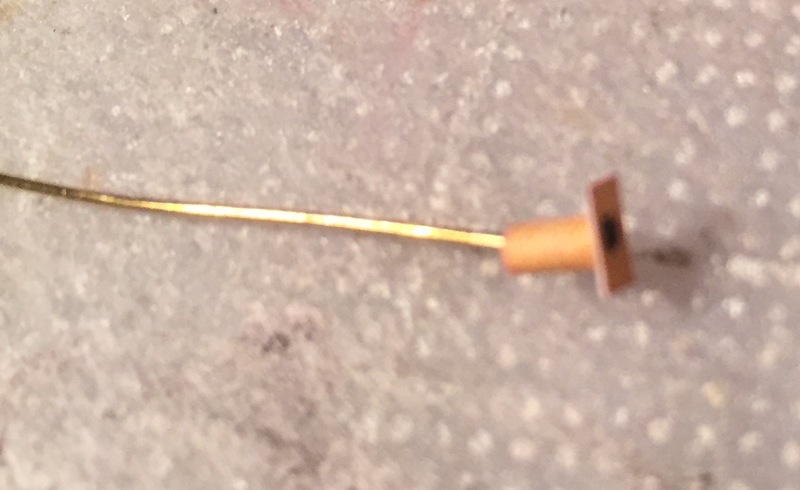 I used a thin 24 gauge craft wire. 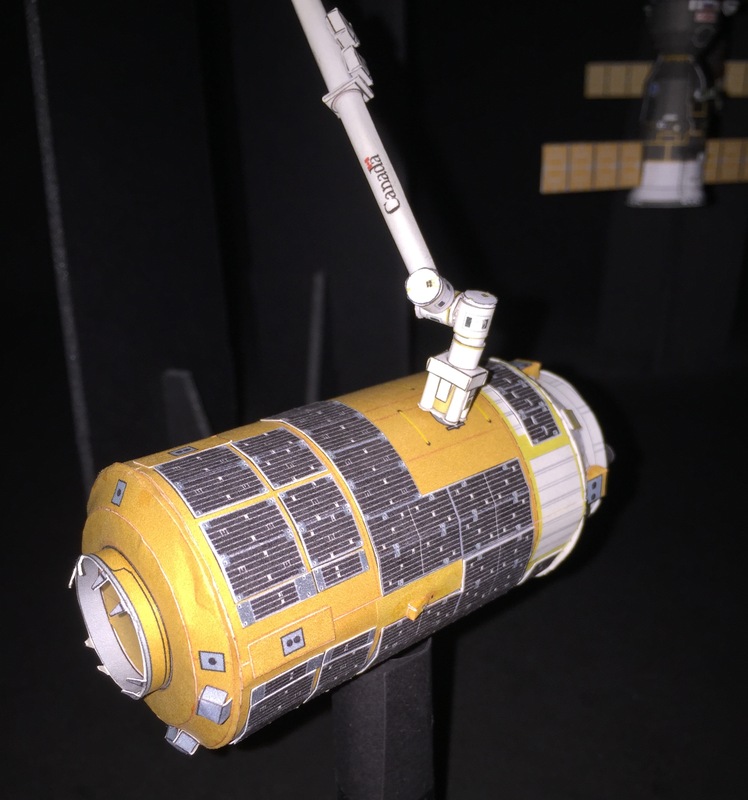 The length of the tether is not to scale, is only for a diorama display. 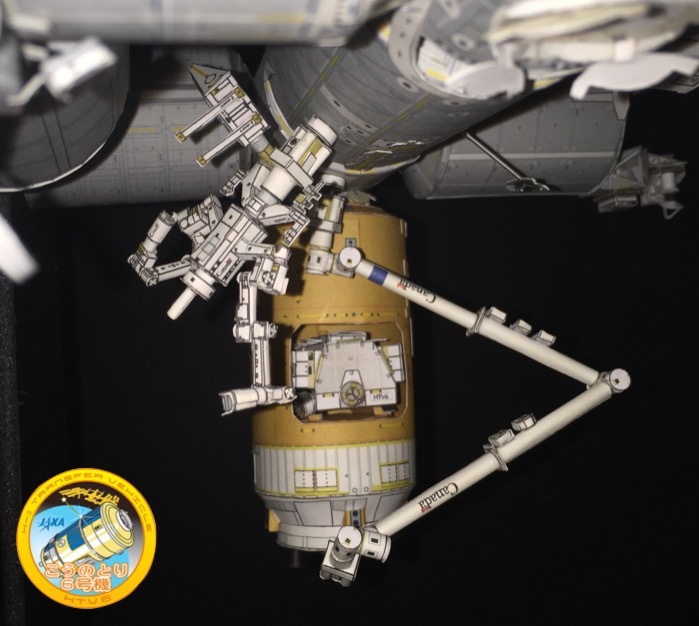 The Kounotori-6 was grappled by the station’s 58 foot long Canadian-built robotic arm on Tuesday Dec 13, 2016 at 5:37 am EST.